This is a great cookie. 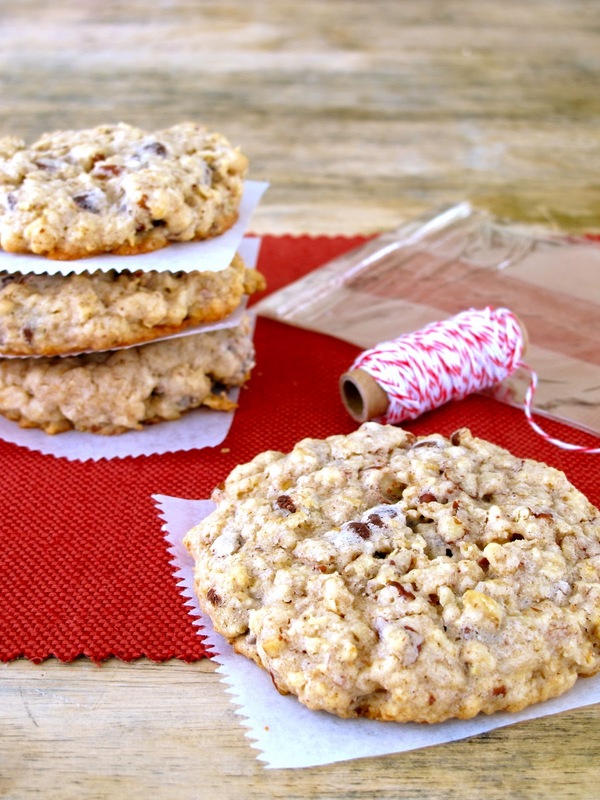 It is thick and chewy, full of oatmeal, pecans and chocolate chips. It is a real stick-to-your-ribs kind of cookie... if there is such a thing. A touch of cinnamon in the dough makes it just right for this time of year. I make these when I want the house to smell great (cinnamon) and I am craving a big, giant cookie that will help satisfy my seemingly never-ending hunger (oatmeal = healthy... right?). I've been pre-baking for the holidays and for the upcoming visits from our family (baby's almost here!) and I know my Dad will love these cookies. He's the type that likes cookies that are jammed packed with anything you can think of - nuts, chocolate, butterscotch, peanut butter, raisins... So, I will bake some now, then freeze the rest in pre-formed balls to have around the house when we have company. Talk about nesting... our freezer is stocked! I'll talk more about that later and give you my list for what to have in your freezer and in your pantry. As I've mentioned before, Mike loves chocolate chip cookies. He only loves chocolate chip cookies. Don't get me wrong - he enjoys (and devours) all of the cookies I make (even the peanut butter ones that he says he doesn't like), but chocolate chip cookies are his absolute favorite. Every once-in-a-while I sneak a cookie like this into the routine... hey it has chocolate chips in it! 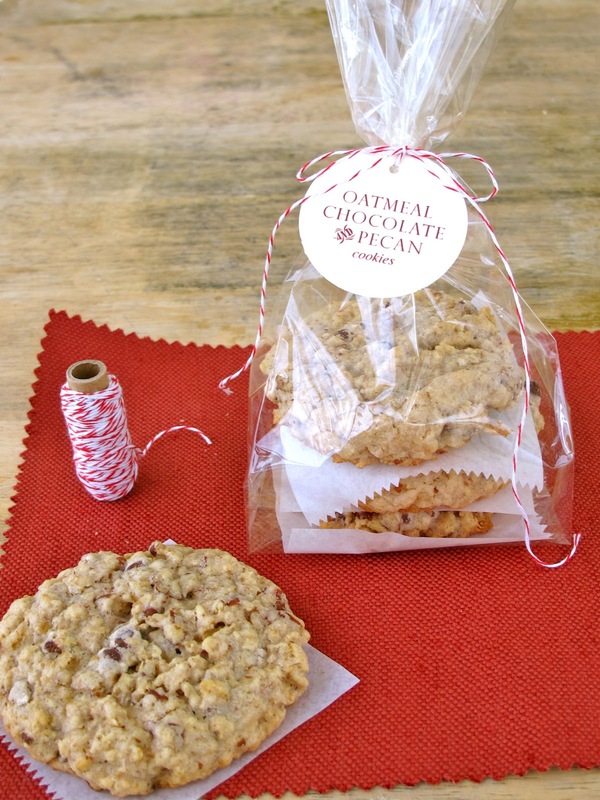 Package these up for a great gift for friends, neighbors, teachers or co-workers! I placed a square of parchment paper between each cookie, then put them in a clear cello bag (you can buy here in my online store!). I tied the "Pecan, Chocolate & Oatmeal Cookie" label on with Martha Stewart Crafts red and white twine from Michaels. Begin by toasting the pecans by placing them on a baking sheet and putting them into a 350 degree oven for 5 minutes. Remove them and chop them into small pieces. For the dough, cream together butter, brown sugar and sugar for a couple of minutes until light and fluffy. Add eggs and vanilla. On low, add flour, baking powder, cinnamon and salt in. Mix until just incorporated. Slowly stir in oatmeal, chocolate chips and pecans. When combined, scoop the cookies out onto a parchment lined baking sheet (you can buy my favorite here!). I like to use a 2" ice cream scoop. Flatten them slightly with your hand to help them bake easily - they are thick cookies and will not spread too much. 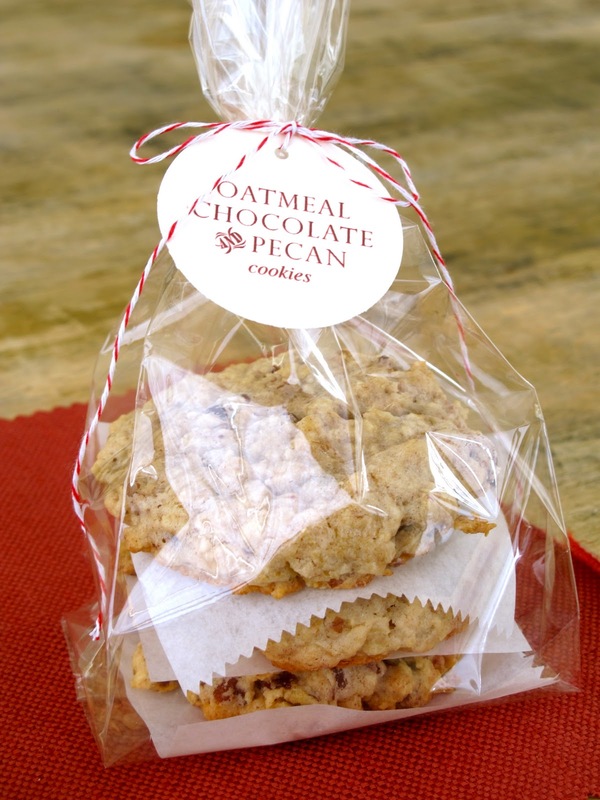 You've combined some of my favorite things: pecans, oatmeal, and chocolate! What a delicious looking cookie, too! What a great gift idea. These are good cookies aren't they! I used to add 3 cups of oatmeal too but they tend to turn out a little dry so I dropped it down to 2.